This is my new favorite coffee cake! Over the past couple of weeks I have had the opportunity to make this cake twice, and it was a hit both times. Back in October I posted a lovely Pumpkin Cream Cheese Bundt Cake that had a ribbon of cream cheese in the center. This coffee cake also has a ribbon of cream cheese running through the center, but it is very different from the filling in the pumpkin cake. This coffee cake’s cream cheese ribbon isn’t as sweet or as light and airy as the pumpkin cake’s filling. The filling in the coffee cake is creamy, dense and delectable. And the addition of lemon juice gives it a tangy contrast to the rest of the cake. I wouldn’t say it is better than the other cream cheese filling, just different. This cake is truly enjoyable with a cup of coffee. Or without. It is just plain enjoyable! Delicious coffee cake with a ribbon of cream cheese in the center. 1. Preheat oven to 350°F; grease and flour (or spray with baking spray) 10-inch tube pan.2. Cream together the butter and sugar until light and fluffy.3. Add eggs one at a time, beating after each; beat in vanilla.4. In a separate bowl combine flour, baking powder, soda, and salt.5. Alternate adding dry ingredients and sour cream to wet ingredients, beating well.6. Make the filling by beating the cream cheese, confectioners' sugar, and lemon juice in a small bowl until smooth.7. Spoon half of the batter into the pan then spread filling evenly over batter; spoon the remainder of the batter over top of the filling.8. Combine topping ingredients and sprinkle over the top of the batter.9. Bake at 350°F for 40 - 45 minutes or until a toothpick inserted in the center comes out clean.10. Cool for 10 minutes then remove from pan; allow to cool before serving or storing in the refrigerator. Sounds and looks like another winner from your kitchen my friend!! I love this kind of stuff, definitely am going to try it! Thanks Rubi--hope you enjoy it! Beautiful coffee cake, I can see why it's your new favorite. Its been too long since I made a coffee cake, I'm saving your recipe, it sounds wonderful! Coffeecake is one of my favorite things, and this is GORGEOUS!! Love that ribbon of cream cheese running through the middle. Thanks Kristan--the cream cheese in the middle is my favorite part! This sounds and looks so wonderful- will have to try this soon (and the pumpkin coffee cake recipe, also)! Beautiful picture, also. Thanks Sarah--hope you try it and enjoy it! Jill, this looks fancy and yummy! Btw, I love your china! I love coffee cake. Fill it with cream cheese and I'm sold. Love this, Jill! Thanks Cassie--I have a little bit of a cream cheese obsession! I seriously love coffee cake,and with the addition of cream cheese your driving me nuts!! Yes, the cream cheese is what makes this cake my favorite! A weakness of mine too, Daisy! Thanks Vicki! Hope you enjoy it! This looks the yummiest. I think, cream cheese is a magic ingredient. Whatever, you include it it, gets richer or creamier. This is our kind of cake. I agree--it is the magic ingredient! Beautiful! I love the look of this cake. I could eat about 3 huge slices right about now! I love a good dense coffee cake. This looks delightful. Perfect with some tea. It just may be Janet! I love that the description of this cake includes "ribbon of cream cheese" in one of the descriptions. As beautiful and tempting as your photos are, I also admire the recipe title and descriptions. Although I'm not big into cake, I love cake in the morning with coffee or tea, which is why coffee cake is one of my favs! Kudos for an excellent post. Thank you so much Alaiyo! Beautiful cake Jill! Love the cream cheese running through the middle! I love the idea of making it in mini loaf pans to give as gifts! Jill, you know I love cream cheese..and the lemon juice probably makes it taste a little like a cheesecake filling! Funny, I've been sick, along w/my daughter's family, w/some crazy virus for 2 weeks; and just today I started craving coffee cake...boy would I love to have some of this! (Must be getting my appetite back!) Thanks! I hope you are all feeling better Bonnie! Coffeecake is defintely one of my weaknesses. Yours does look fabulous. I really like the cream cheese running through the middle-delicious post! OMG!!!! Your pics are so superb and alive, just like I am seeing the cake right in front of me. Look simply delicious and though I am not a dessert person and don't fancy anything sweet, that does not mean I don't admire those baked and shared by others. LOVE Coffee cake, and this looks wonderful! I love the idea of the cream cheese layer. And your pictures are stunning! This is a gorgeous coffee cake. I'm sure that it tastes so good, especially with the cream cheese layer. Lovely photos and dishes. That is just gorgeous and looks perfect to have with a cup of coffee (or in my case tea)!!! OMG ...un hermoso pastel de café esté es mi preferido luce absolutamente maravilloso y tentador con la crema,abrazos hugs,hugs. I do love a good coffee cake. Yours looks great with the cream cheese ribbon running through it. I hope you find some citrus where your at, we are getting them a little late here, so maybe you will be able to find some soon. Hope you have a great weekend. Thanks Gina--I hope so too! I will keep looking! Oh, gosh, what a spectacular recipe, Jill!!! Perfect coffee cake with cream cheese AND a streusel topping. Wow - what a terrific recipe and your photo is absolutely stunning! I could just walk into my computer and LIVE in that photo! What a beautiful cake..I love your photo, very elegant and wonderfully served!Sound like a very delicious cake! Nom! This looks seriously delicious! That looks and sounds yummy!!! Would love a big piece of that. What a lovely coffee cake! I'd go for a slice of that any time at all. Beautiful coffee cake. 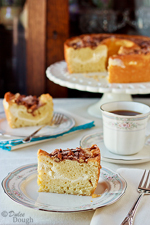 I have to stop looking at your website before eating breakfast as now I must have coffee cake! Thanks for sharing such mouth-watering pictures and recipe. Exactly my idea of heavenly food. That cake is simply stunning. I love the cream cheese layer in the middle. That would be a wonderful treat to wake up to! This was SO good! When I made it I tasted the cream cheese mixture for the middle and just about threw the whole thing out. It did NOT taste good at all because of the equal parts lemon juice and powdered sugar. But I already had everything measured out & the eggs cracked so I took a chance. I'm glad I did! The filling was a wonderful counterpoint to the cake and topping. This cake isn't sweet on sweet like most other coffee cakes because of the filling. The only change I made was using cashews instead of the walnuts that are called for because it's what I had on hand. They added a very unique flavor to it & I'll use them again next time I make the cake. Thank you for posting! I made this for church and everybody loved it! Like The humble food snob I to was a little worried since the lemon filling was strong, but it turned out great. I tried this out the other day and it was delicious everybody loved it. This was delicious! I didn't have a tube pan so I had to use my bundt pan and therefore couldn't use the topping but even without it, it was delicious! Jill, your recipes are amazing! 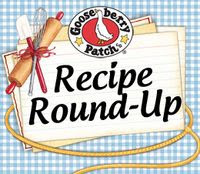 I normally don't like so much more than one recipe of every chef, cook, blogger, lol. You are great! Thank you so much Vanessa! I'm so glad you enjoyed this cake!